•But whither LeBron? An ESPN reporter has been unable to confirm with ESPN that James will announce his decision on ESPN, but sources within ESPN have told the ESPN reporter that ESPN is in discussions with James. I think he's just going to be teaming up with Beadle for SportsNation. •We bust on Tony La Russa for his overmanaging, but at what point last night would it have been a good idea to remove his closer from the game? When he let a 9-3 ninth inning lead become a one-run game? When it was tied? How about after a three-run walkoff home run from Seth Smith, that clinched a 12-9 win for Colorado? Any of those times would probably have been good. •Police say they know who shot Michael Vick's former associate at Vick's birthday party last month, but they can't press charges because the victim won't cooperate. They could still explore charging Vick with hosting an "all-white" themed party, which was cool, like, 10 years ago. 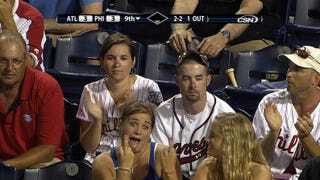 •The Phillies fell in extra innings to the first-place Braves, dropping 5 back in the east, and one fan showed her double displeasure. Meanwhile Bill Conlin is calling for the head of whoever let Cliff Lee go, because he would have somehow made sure Philly got more than three hits in 11 innings. All right, we're off and running. Stay frosty.